Water ... 75% of the Earth's surface. The well spring of life. Milleniums ago, it was pure and unsullied as the farthest reaches of space are today. But inevitably civilization and particularly, industrialization changed that. Today, water is literally not safe to drink. There is simply no telling what may be in your water. Chlorine, chloroform, lead, chemicals, algae, bacteria, volatile organic compounds, perhaps even toxic waste. Water therefore needs to be fully treated, to be cleansed of all impurities. Such cleansing requires a highly sophisticated treatment system. Nearly three-fourths of the Earth's surface is water. Why not turn it into revenue? We make it simple for you to set up your own water refilling station and get into the water business at the easiest and most economical way. 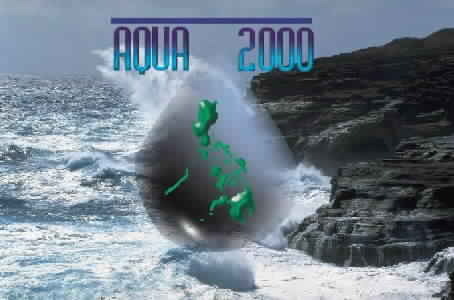 Aqua 2000 Water Technology Incorporated is a Philippine organization incorporated in June 1997. Its principal office is located at 78 Mindanao Avenue, Quezon City, Metro Manila, Philippines. The company is a member in good standing of the Water Quality Association - the respected international trade association representing retailers, dealers, manufacturers and suppliers of distinctive industrial, commercial, household and small water treatment systems. We are also a member of the Philippine Franchise Association - the primary industry group that counts among its leaders and members the most reputable franchising firms in the country has added another accolade to its name. Recently, the company has joined the league of the country's biggest and most successful companies as it vowed its membership to the Philippine Chamber of Commerce and Industry. Historically, the company's United States manufacturer spans more than a decade in engineering and manufacturing the superior osmosis water treatment systems, designed to meet the rigorous demands of applications on military ships, high technological research vessels, hotels and water bottling plants worldwide. Moreover, the manufacturer constructs precision equipment for two of California's largest water store franchises and utilizes state of the art technology and unparalleled quality components. At present, Aqua 2000 has expanded to more than 90 outlets not only in Metro Manila but also in various provinces as far as Ilocos Norte down to Davao. Highly regarded in the industry, Aqua 2000 is headed by a member of Who's Who Registry - Platinum Edition, 1992 - a listing of distinguished, innovative persons who are influential in various endeavors. 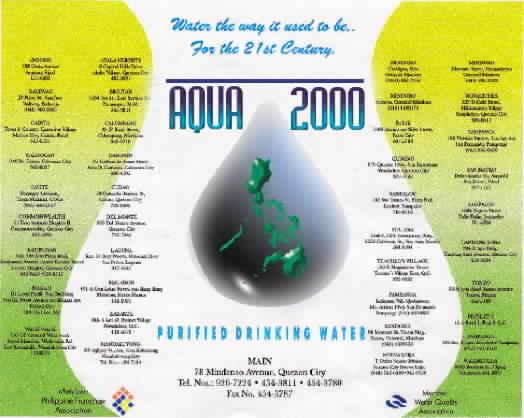 With over ten years experience in the water purification industry in Los Angeles, California, Aqua 2000 caters to the Filipino community and currently installs more than 100 residential systems monthly. With the deteriorating quality of water we have right now, it is difficult to ignore the danger it could bring to our families. And this concern is what lead to a concordant vision. To bring high technology, state-of-the-art water purification process to the Philippine water industry. To give every business minded Filipino the chance to invest and to be involved in the water industry and offer them all the security and support as they climb their way to the top. And to provide the purest and safest drinking water that will cater to all Filipino families. "First, give people what they need: the purest, safest drinking water available in an unsafe environment. Then make it easy and fun for them to buy more. The result? Satisfied customers and successful franchise owners."